I swear to God I had nothing to do with this. 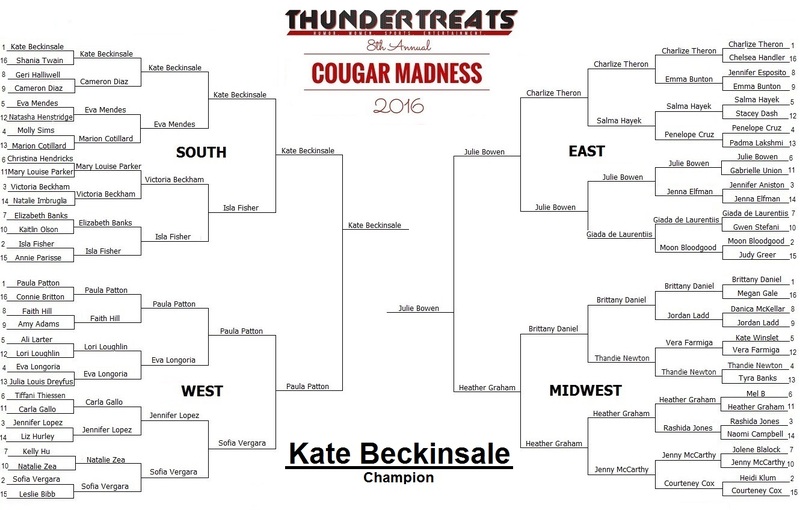 I was really hoping someone could knock Kate Beckinsale off her Cougar Madness throne, but we will have to wait another year to see if that’s even possible. Charlize Theron, Paula Patton and Brittany Daniel came in this year with high hopes of taking then two-time champion Beckinsale down. They did not succeed. No one can, no one has. She is now an astounding 18-0 since her first tournament in 2014. Not even the Golden State Warriors stand a chance against Beckinsale. On the other side of this championship matchup was Julie Bowen. Bowen got her ring in 2013 and, in an ironic twist, is the last champion of the tournament not named Kate Beckinsale. So for the first time ever, we now have a Cougar Champion that is holding back-to-back-to-back titles. While Beckinsale is enjoying her reign, we will get back to work and look for more talent to challenge the Queen. While Beckinsale seems unstoppable, we must remember that new Cougars are turning 40 everyday! Until next year, my friends! Thank you all for voting and making the 8th Annual Cougar Madness Tournament another huge success!